A dragon tattoo is a symbol of power courage strength and strong will. Dragons were valued for their warlike qualities and were often believed to be protectors of valuable treasure. In medieval times it was said that kings used dragons to protect sacred treasures in caves. No one could take the treasure without slaying the dragon first. This included the king also. It is no wonder that the dragon tattoos is such a popular symbol. As in all things there is a big difference in the way the people of the east and the west view dragons. In the east the dragon has been viewed as a symbol of benevolent power that protected people, dispensed life giving water and heralded fertility and good fortune. In contrast western cultures viewed the dragon as something to be feared and hated since it destroyed villages to loot and hoard treasure. So a dragon tattoo is used to symbolize a mean stubborn and tough image in the west. In the east however the dragon tattoo is a representation of might power and divine grace because the dragon is seen as a bearer of profound blessings. The dragon represents the four natural elements – earth wind fire and water and also represents the four directions – north south east and west. Just as nature has the capacity to both nurture and destroys so does the dragon. And just as nature encompasses all the four directions so does the power of the dragon. 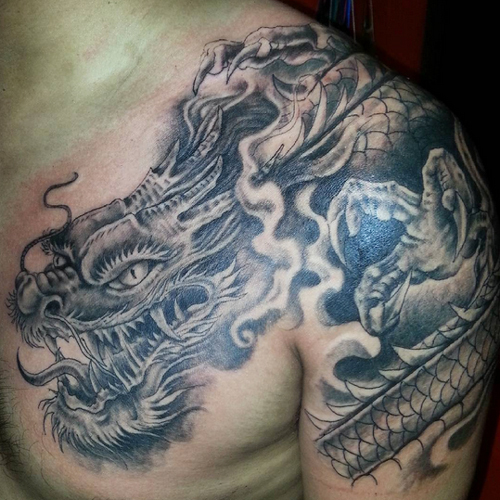 Therefore dragon tattoos are seen as indicative of special strength and abilities. Today the dragon tattoo is seen the world over as fashionable and a representation of being free and fearless. The most common form of design in a dragon tattoo is still the eastern and oriental representation. 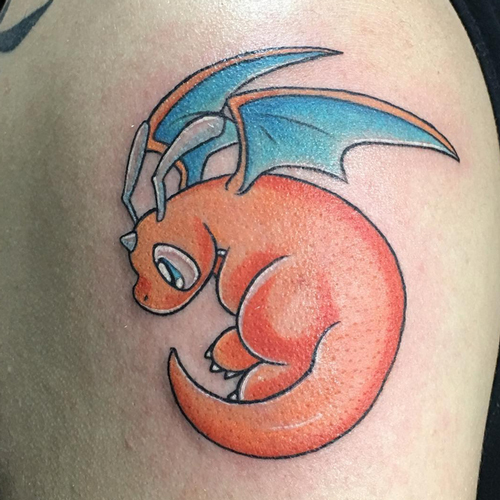 Dragon tattoos are normally drawn in black and highlighted with colorful flames and fire.